Sharing a few snapshots of works in progress by some lovely friends at my craft group – as I can’t share what I’ve been working on until after 25th (current project just finished as a Chrissy gift). So, here goes, Krissy’s hexi patchwork bag. She has made several of these, all hand stitched. Patience of a saint! Jane’s teal shawl, halfway there. The cone is 4 strands worked together, can’t wait to see it finished. One of the other ladies, Susan has a matching cone, so it’s a bit of a competition over who finishes their’s first! 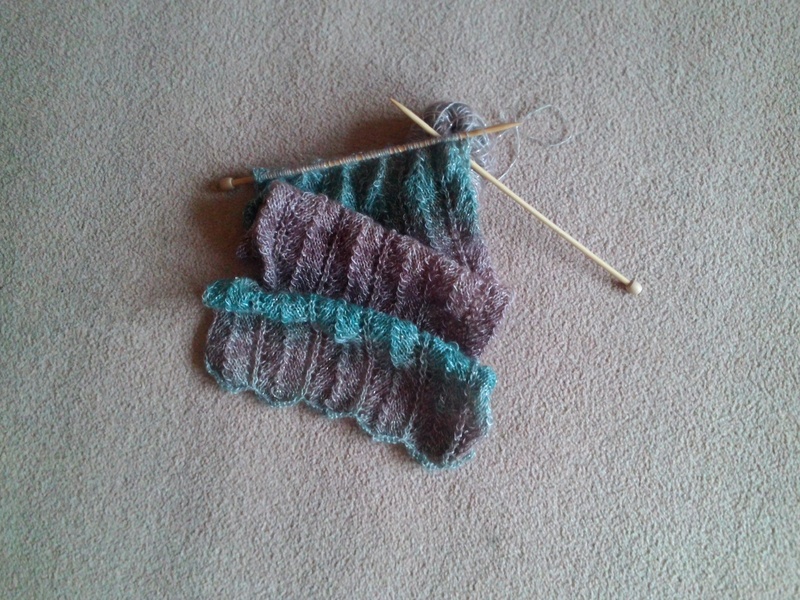 Liz is making a cream alpaca sweater – to us it’s a mystery as there is no photo on the pattern. Liz is one of the fastest knitters I know. Marianne has been busy crocheting sparkly tree decorations. As I said a peep into last week’s get together. This week will be our last one before Christmas. To celebrate In the Loop style we aim to all have made one Christmas card in any style of our choosing. They all go onto the table and we all take a card from the same pile (but not our own obviously!). I can’t wait to see what card I am dealt. Does anyone else out there do ‘Secret Santa’ Christmas card giving ? This entry was posted in Uncategorized and tagged cake, Christmas, crochet, knit, patchwork, sew. A very mini project completed, a tiny Christmas hanging decoration. Quick and fun to make! Hurrah, one less project on my list of WIPs and for Christmas 2017. This entry was posted in Uncategorized and tagged Christmas, Hoop, WIP. We’ve had a light smattering of snow and the Christmas tree is up courtesy of hubby and son. But it’s happened again – Christmas is almost upon us and I am starting to panic about not being organised enough! A stinker of a cold arrived at the end of last week and it’s really knocked me for six. Having not left the sofa for days, fuelled only on hot honey and lemon drinks I haven’t got a lot done. It’s imperative I finish knitting two items before the 25th and I hope I will get those done, but I sit looking longingly at a little pile of fabric on the dresser and I think amongst other things ‘thank goodness it’s Christmas next year, the table runner I’d planned will be lovely next year..’. Practically every year it comes to December and I haven’t quite got my Christmas ‘act’ together. I like to be spontaneous, perhaps that’s why I can’t bring myself to start planning too far ahead. I am not one of those people who start creating in January ready for December. This teal ball is turning into something I can’t share here yet. Let’s just say it involves 2 sticks and a little counting here and there. So in my five minutes of lucidity this afternoon, I’ve knitted two rows, ripped back one, knitted two more, squinted at the last wondering if the pattern sits right, then I’ve blogged here. Later on I need to plan food for 24th, 25th and 26th December. I at least need to think about what we’ll eat and how long it all takes to get it together and what allergies and preferences guests have. This year so far there are no vats of soup or yummy cakes in the freezer. What have I been doing I ask myself? Oh well, back to the couch for a bit. This entry was posted in Uncategorized and tagged Christmas, december, hat, knit. When is a snowman not a snowman? Yesterday snow fell in some parts of the UK. Many people get quite excited at the first snow of the year, though I know most of us hope it falls when we are safe at home or where we want to be, snug and warm and our loved ones are too. Here near Bromley in Kent we had a smattering. During the morning whilst I sat in a cafe with my crafting friends there was a flurry for about fifteen minutes. At first a few flakes, then the wind blew it sideways and we wondered if someone up the road actually had a snowmaking machine and was teasing us. The snow got a little heavier but it didn’t come to much. I watched from indoors knowing that if I dared get my camera out and run outside it would stop, plus I was warm and cosy, I had a cappuccino in front of me and my knitting in my hand. It stopped as quickly as it had begun. A trip to Whitstable in the afternoon was decided on a whim. It’s about an hour’s drive away, and it could have been seen as slightly mad to consider it with the inclement weather. However, it was fun (and very chilly with a breeeeeeeze off the sea) and we found they’d had a little more ‘snow’ than we had. This entry was posted in Uncategorized and tagged BROMLEY, craft, knit, oakley coffee, petts wood, relate, snow, Whitstable.